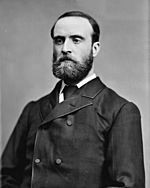 Charles Stewart Parnell (27 June 1846 – 6 October 1891) was an Irish member of the House of Commons of the Parliament of the United Kingdom of Great Britain and Ireland. He led the Irish Parliamentary Party. He played an important part in the fight for Home Rule for Ireland. Charles Stewart Parnell was born in Avondale, County Wicklow. His family was upper class. He was the seventh child of John Henry Parnell and his American wife Delia Tudor Stewart. Parnell's great-grandmother was in the Tudor family so he was related to the British Royal Family. His parents separated when he was six. He was sent to different schools in England, where he was unhappy. His father died in 1859 and he inherited his fortune. He then studied at Cambridge University (1865-9) but never graduated. He was Sheriff of his county, Wicklow, prior to being an MP (member of the House of Commons). 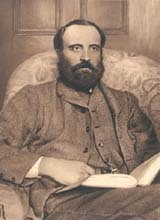 Charles Stewart Parnell was first elected to the House of Commons, as a Home Rule League MP for Meath, on 21 April 1875. During his first year Parnell mostly stayed quiet and watched. He first drew attention in 1876 when he said a group of Irish rebels called Fenians (accused of killing a police officer) did not kill anyone. Parnell fought for Ireland's right to be self-governing Home Rule Movement. At first he met with Fenians, but he later decided to work with Michael Davitt. He was elected president of Davitt's movement, (called the "Land League") on 21 October 1879. After becoming the MP for Cork City, he formed a new group with ideas from many other groups called the Irish National League which later became the Irish Parliamentary Party. Although Ireland did not become independent for many years, Parnell's work in Parliament pushed Ireland much closer to their goal by unifying Irish politics. On 24 December 1889 Captain William O’Shea decided to divorce his wife Katherine O'Shea. O'Shea had already separated from his wife, but would not divorce her as she was expecting a substantial inheritance. O'Shea at last filed for divorce. He claimed she had an affair and three children with Parnell. Parnell did not reply to the claim, and the divorce was granted. Because divorce is not allowed by Catholics, many Catholics who supported Parnell did not like him anymore and he became less popular. Parnell married Katherine after her divorce. The damage from his affair caused many people to lose respect for him, and he became less powerful. Many members of his party left him. He died on 6 October 1891 of a heart attack and in the arms of his wife. He was 45 years old. 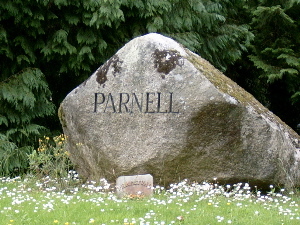 Parnell's grave in the predominantly Catholic Glasnevin Cemetery in Dublin, alongside Éamon de Valera, Michael Collins and Daniel O'Connell. Charles Stewart Parnell Facts for Kids. Kiddle Encyclopedia.